Watch out Canadians, there’s a new airline in town; Swoop, Canada’s new airline is coming; its a subsidiary of WestJet. Another new airline is here, its headquartered in Calgary, AB Canada and is the low cost arm of WestJet. Which is a bit ironic as WestJet started as a low cost carrier to combat rival Air Canada (AC). First flight is scheduled for June 20, 2018. Tickets are on sale since Feb. 1, 2018. Currently, they plan to fly to Halifax, Hamilton, Edmonton, Abbotsford and Winnipeg. So if you live in one of these cities, you’re in luck. I’m sure they will add more destinations as demand increases and they received more airplanes. They currently have four 189 seats Boeing 737-800 with standard seat pitch 29-30 in. and Extra Legroom seat pitch 34-38 in. They do have wifi and in-seat power too. So legroom is quite limited, that’s how they keep the fares low and pack so many of you in. You do have to pay for your carry-on and checked bag. But, you are allowed one free personal item (Dimensions/Weight: 16” x 6” x 13” (41cm x 15cm x 33cm) which must be able to fit under the seat in front of you. Examples include: Small backpack, purse, laptop bag, briefcase). 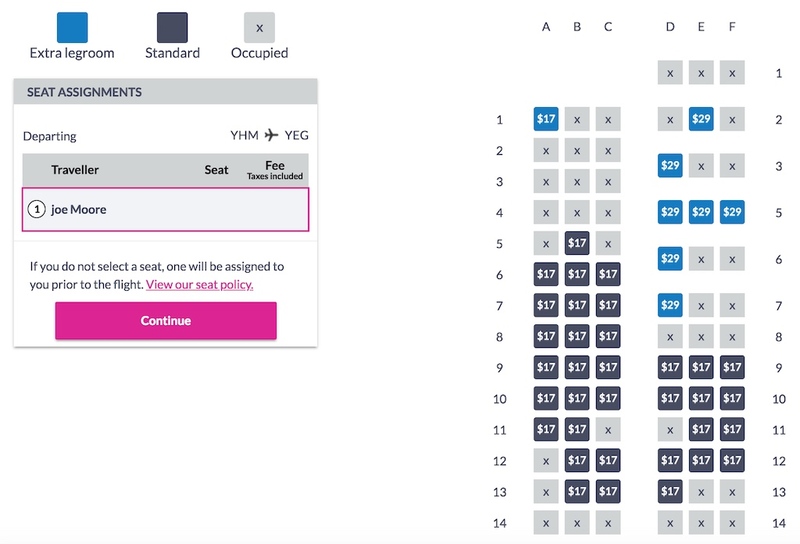 If you need a seat assignment, it’s at least 5.25 CAD, but if you gamble and wait for day of departure when you check-in, you can get it for FREE! But you may get a middle seat. When I fly low cost carriers or carriers that charge for seat assignments before check-in, I usually don’t pay for a seat assignment. I gamble and try to check at the check-in mark, usually, 30 to 24 hours before departure. Or if I have elite status on that airline, then I’m in business. Sometimes I win, other times, I’m in the middle seat like on my Ryanair flight to Bologna from Stansted in 2017. 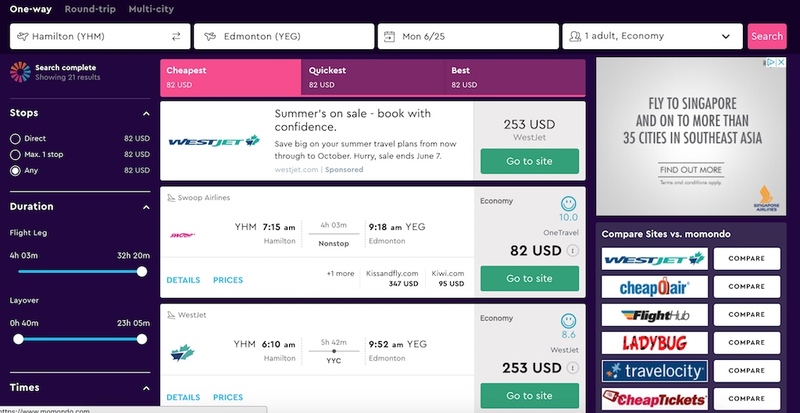 Head over to FlySwoop.com to get on the next flight. You may also book on my booking partner Momondo.com. The flights are not yet showing on Google Flights. As its a new airline, they are trying to fill seats. They’ve created a Flight Deals page, so head over there and pick up some good deals. I’d think though as a ultra low cost carrier all your fares are good deals. I’d be remiss if I did not tell you that you should always get travel insurance as I do for all my trips. It’s peace of mind. I use Allianz and you can and should as well. Well, we’ll see if this works. I think there are too many low cost carriers and oftentimes, carriers start off as low cost and then ultimately become mainstream. Are you gonna fly them?